The financial crisis and austerity politics in Europe has had a devastating impact on public services, social security and vulnerable populations. 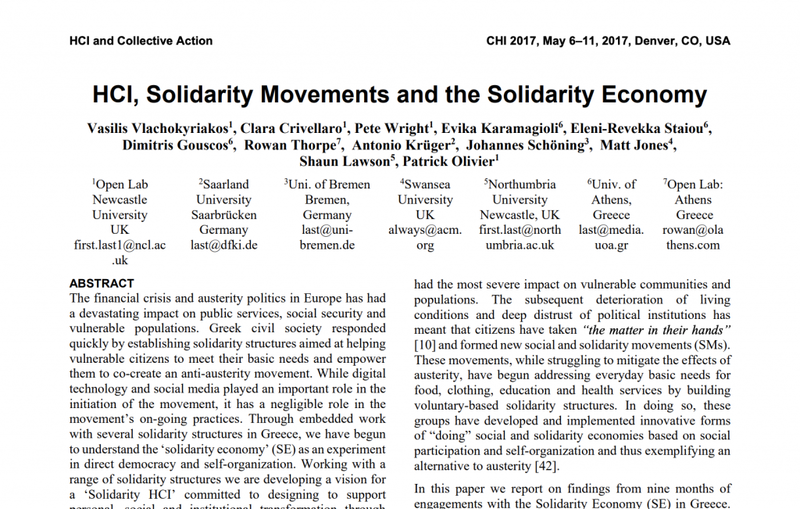 Greek civil society responded quickly by establishing solidarity structures aimed at helping vulnerable citizens to meet their basic needs and empower them to co-create an anti-austerity movement. While digital technology and social media played an important role in the initiation of the movement, it has a negligible role in the movement’s on-going practices. Through embedded work with several solidarity structures in Greece, we have begun to understand the ‘solidarity economy’ (SE) as an experiment in direct democracy and self-organization. Working with a range of solidarity structures we are developing a vision for a ‘Solidarity HCI’ committed to designing to support personal, social and institutional transformation through processes of agonistic pluralism and contestation, where the aims and objectives of the SE are continuously re-formulated and put into practice.